Occasionally a customer will come up during a sale and ask, "How do I become a Good Ju Ju vendor?" They typically want to know what the costs are (square footage, commission, etc.) and to whom do they need to speak? We always direct them to the right person knowing they will get the answers they need. However, there are certain things anyone will need to know should they possess the level of insanity necessary to dive in to 'vendor-dom.' Under the heading entitled "if we knew then what we know now," here are a few must haves necessary in becoming a successful Good Ju Ju vendor. 1. The name and number of a good chiropractor or massage therapist. Selling at Good Ju Ju requires heavy lifting, whether it be boxes of smalls or furniture. And, of course, there is the sale itself. Nineteen hours over 2 days on your feet can take its toll. Muscles and joints aren't getting any younger, and sometimes we need help putting ourselves back together. 2. The willingness to give up having a good manicure. Take a look the next time you're in the store. You can tell the vendors by their short, broken, paint-spattered fingernails. 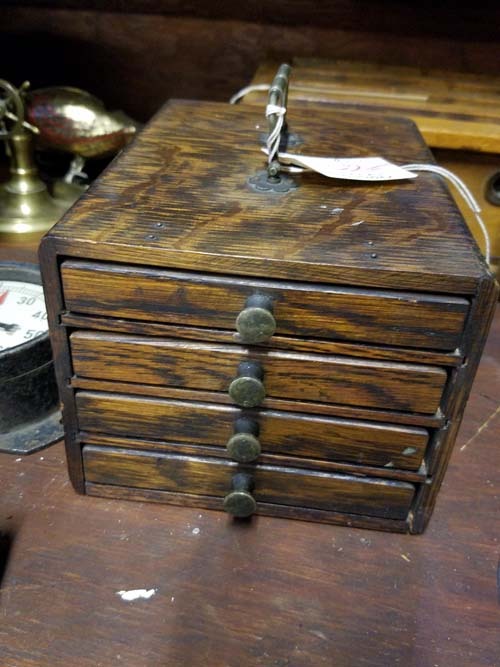 It's almost impossible to have a beautiful set of nails when you are lifting, sanding, painting and staining numerous pieces of heavy wood furniture or creating small, one-of-a-kind pieces. We've all resigned ourselves to having lovely nails when we retire, whenever that will be. 3. A pickup truck or heavy duty van. You'd be surprised how much room a 9-drawer dresser or armoire takes up. Save your Mini Cooper or sedan for trips to the grocery store. When hauling heavy and big loads, the larger the vehicle the better. 4. The name of a good brake specialist. Every vendor at Good Ju Ju has at one time or another been driving along and stood their vehicle on its nose because someone put a beautiful piece of furniture out on the curb for pick-up. Keeping those brakes in tip top shape to catch that fantastic bargain is important. Having good reflexes and excellent peripheral vision doesn't hurt either. 5. Flexibility in scheduling. Remember those wonderful, spur-of-the-moment 3 day weekends or vacations? All family trips, reunions, out-of-town weddings, cruises, etc. will now have to be scheduled in and around both the First Friday sale days and the setup week preceding. A BIG calendar to keep track of everything with those days X'd out will go a long way toward retaining your sanity. 6. A long list of understanding (and strong) friends. Friends willing to assist at a moment's notice will be a big help. If they will work for food and drink (alcoholic or non), consider that a plus. Remembering them with cookies, snacks and the occasional hard-to-find item on their wish list will grease the wheels. 7. Last but not least, having an understanding partner or spouse is a MUST. Receiving late night phone calls from other vendors about that fantastic garage/estate sale, asking for tips on how to finish a piece, or just venting, can create a rift in the best of relationships. If you are lucky enough to be married to someone who will overlook the interruptions, help you solve a particularly sticky problem, or tuck a blanket around you after you fall asleep at the dinner table, then you just might have all you need to succeed as a Good Ju Ju vendor. But seriously, if you are interested in knowing more about being a dealer at Good Ju Ju, take a look at this page. It answers many questions on how to take the next step in becoming a dealer with us. For local Kansas City shoppers, First Friday weekends in the West Bottoms are like a warm, friendly hug. Locals know that they can come by themselves, or with family members and friends, and have a wonderful time browsing, shopping, visiting, eating and taking a break from the everyday. 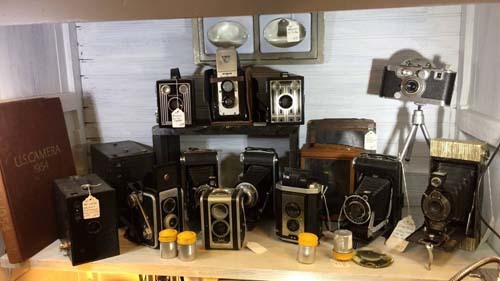 As word about the wonderful deals to be had has spread, shoppers are coming from farther away, making Kansas City's West Bottoms district a destination antique and vintage shopping event. It seems eons since one woman had the crazy (some called her a lunatic) idea to open a store in Kansas City's then decrepit West Bottoms warehouse district. Trish Moore's vision did not include any old store with run-of-the-mill merchandise. She created a space where customers could find one-of-a-kind, repurposed furniture and decor infused with, as Trish put it, 'good juju.' And so, Good Ju Ju was born. It was slow going at first. Original vendors fondly reminisce of days when they played solitaire or read magazines to pass the time between customers. That certainly isn't the case now. Expanding on Good Ju Ju's success, other stores soon followed. 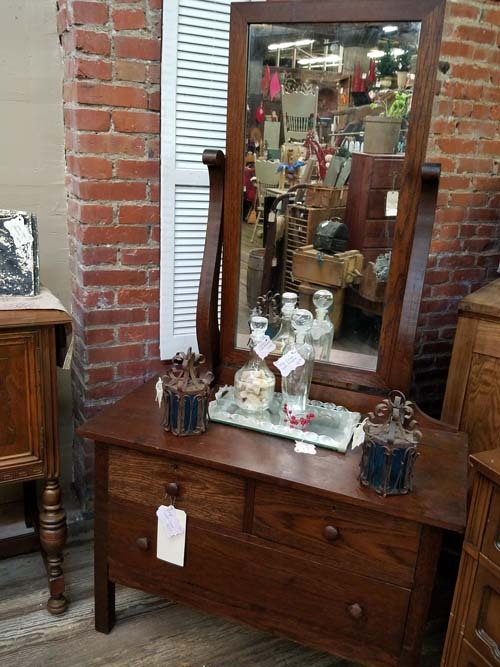 Bottoms Up, Bella Patina, Restoration Emporium, Hickory Dickory, Nook & Cranny and scores more have joined Good Ju Ju in creating a truly wonderful weekend shopping experience in Kansas City’s West Bottoms area. National brands now realize the benefits of partnering with West Bottoms stores. 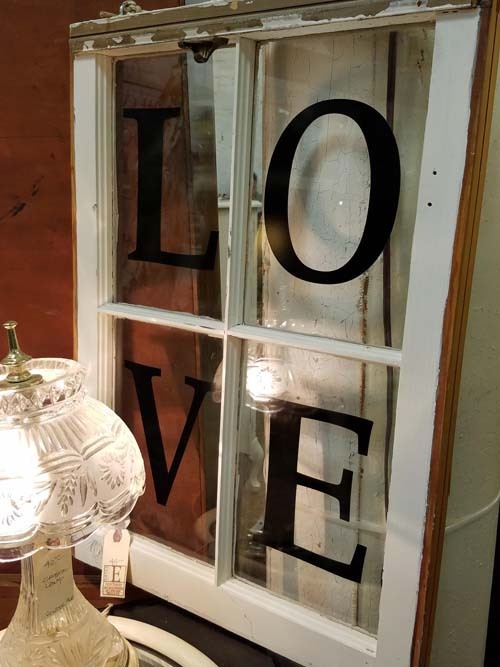 Chip & Joanna Gaines' Magnolia Market recently joined with Restoration Emporium. West End Salvage recently created a popup space at Good Ju Ju. Vintage Whites Market's first Kansas City event was held on the 12th Street Bridge this summer and they had HGTV's Pioneer Woman Ree Drummond as a special guest at this event. As the West Bottoms customer base grew, word of mouth spread. Interior designers now flock to the Bottoms with customers' wishes in mind, tape measures and Smart phone cameras at the ready. Every First Friday weekend you are sure to hear a couple talking about the very reasonable price on an item and wishing they hadn't already purchased a dining set/dresser/hutch somewhere else. And it's those reasonable prices on high quality furniture and decor that are beginning to draw antique and vintage dealers to the West Bottoms. Dealers from as far as Texas, Oklahoma, Arkansas, Michigan, California and more are hauling empty trucks and trailers to the Bottoms, filling them to the tip top, and taking them back to their stores and markets. Imagine if you will. A dealer can spend gas and time to buy a trailer-full of merchandise here in Kansas City, return to their location, price the same merchandise, AND make enough of a profit for them to come back and do it again, and again, and AGAIN. Those are the kinds of bargains to be had at Good Ju Ju and other stores in the West Bottoms. Adding to the shopping ambience, food venues have opened in many of the stores. Joined by food trucks lining the streets, the Kansas City West Bottoms shopping district wears a carnival atmosphere on the First Friday and Saturday of every month. The smell of hamburgers, BBQ, roast beef, tacos, vegetarian fare, kettle corn and more waft through the streets, accompanied by seasonal music (often provided by live musicians). Pickup trucks, SUVs and vans safely traverse the crowds, loading up their purchases to take home. Security keeps a watchful eye over the proceedings. All are safe -- all are welcome. Come on down and enjoy yourselves. Good Ju Ju and the West Bottoms shopping district, as if a living thing, breathes positive energy and good will. A tiny 'Trish' seed, planted and lovingly tended, has grown into an event of which Kansas City can be proud. Need a map to all of Kansas City's West Bottoms vintage and antique stores? Here you go! Roughly 30 stores open up on First Friday's weekends in Kansas City, just 1/2 mile West of Downtown KC. Vintage Made Modern is my Mantra! 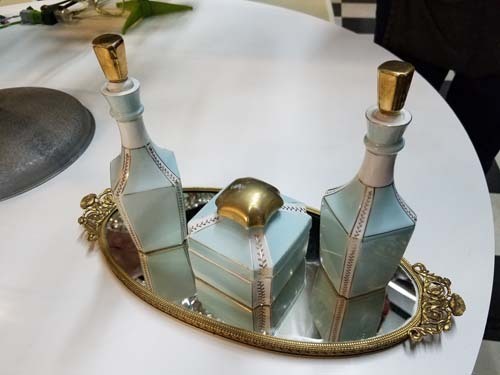 Vintage Made Modern has been the common theme throughout my entrepreneurial journey! Vintage content has always inspired my work at my company Indygo Junction’s sewing patterns and books from creating fashions with hankies in the book Hankie Style to reinventing redwork designs with a modern twist in Folk Art Motifs. How about aprons? 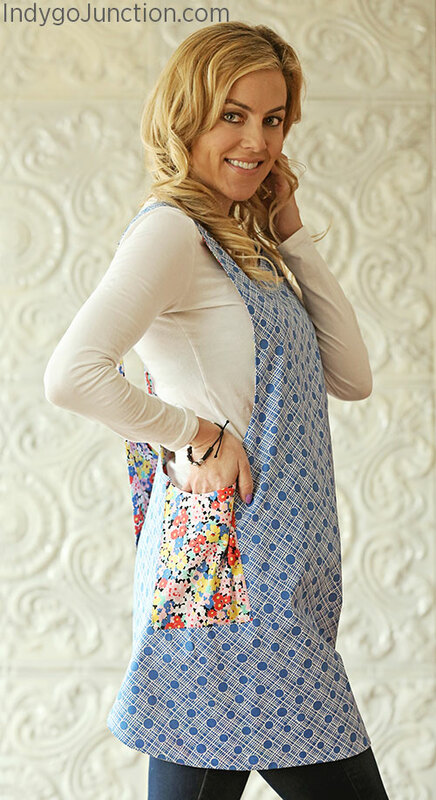 This vintage style inspired our popular Crossover Reversible Apron. I love incorporating vintage textiles and recycling thrift shop fabric finds into clothing, purses and home décor. Truth be told, I am an “addict”. My vintage addiction has led me to build an expansive collection of vintage textiles from quilt to embroidery as well as ephemera. It was the collecting of vintage fashion imagery that led me to discover the work of Mary Brooks Picken and the Woman’s Institute of Domestic Arts and Sciences and write Vintage Notions: An Inspirational Guide to Needlework, Cooking, Sewing, Fashion and Fun. I love sharing the wealth of knowledge from the Woman's Institute’s teachings which have so much relevance for today…from green sewing techniques to discussions of starting your own sewing business, as well as looking to domestic arts for creative fulfillment and happiness. You will be inspired by the stories of Mary and her students to seek contentment and joy through creativity in your own life. 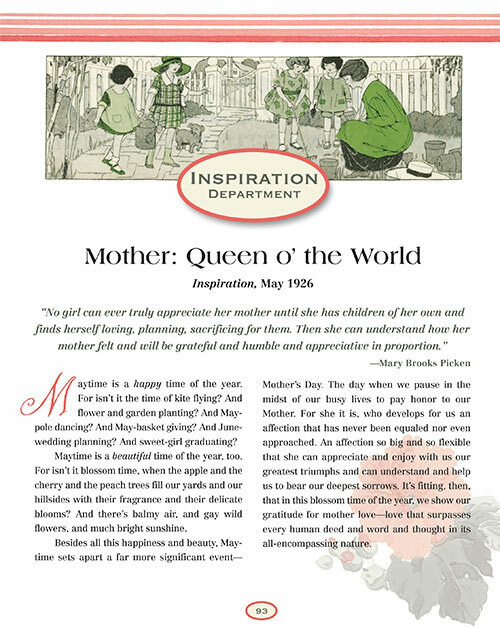 Compelled to continue to share Mary and the Institute’s timeless content, I created the Vintage Notions Monthly magazine. Learn more about it in this video or visit our website to download a FREE sample issue. The Vintage Notions collection is the inspiration for much of my publishing work as well as my fabric lines with RJR. My current collection - Vintage Made Modern - Stitcher’s Garden was created from a series of vintage embroidery patterns and vintage fabrics dated 1932. We’ve also created a free PDF download containing gift tags featuring this fabric line. Visit our website to download them today. We’ve also created a series of Vintage Notions Coloring Books perfect for the vintage lover! My newest brand Fabriflair™ was also inspired by a vintage piece in my collection. When I created my own Radiant Star from our dimensional paper piecing kits (there are six to choose from), being a Jayhawk, I had to make mine crimson & blue! Go KU! Don’t miss a visit to my website where I have an extensive library of FREE vintage images & patterns from my collection. I am a designer, author, & founder of Indygo Junction. A relentless passion for all things vintage led me to launch AmyBarickman.com filled with my favorite vintage finds delivered in books and free images and printables. Follow my journey as a creative entrepreneur on my blog. Just Because You Could, Doesn't Mean You Should. Being a Good Ju Ju vendor is a joy. Where else can you do what you love and meet lots of wonderful people in the process? Let's look at a dresser renovation. Now, if you already have the dresser -- great!. If not, then searching through garage sales, estate sales, thrift shops, used furniture stores or Craigslist will take some time. Be sure to purchase good quality furniture, with sound drawer runners and no structural damage. Solid wood/wood veneer pieces will cost considerably more than those made of MDF (medium density fiberboard) or particle board. If you plan on painting your dresser, then it's time for a trip to the hardware store. You will need paint $15-20), a paint brush ($5-10), some sort of topcoat/polycrylic ($15-20) and a foam brush ($1) for the topcoat. Before you paint, you might need to sand or degloss the original finish. Add to the list sandpaper in a variety of grits ($5-15) and/or a liquid sandpaper/deglosser product ($10-20), and tack cloth ($5) to remove any bits of sawdust or debris. All of the above implies doing things manually. You could invest in an electric sander or paint sprayer instead, which would cost more. Or, if you would like to use a chalk paint & wax technique rather than latex, that will add another $20 to your paint cost and $20-30 to your brush cost. If you're utilizing a piece of furniture you already have, then your costs so far are in the $56-81 rangeIf not, add in the cost of your dresser. But wait. If you want to change the hardware or replace missing hardware, then add that in. Most good quality hardware runs between$5 and $10 per drawer/door. On a 9-drawer dresser that can add up. We won't include hardware in the above totals, but be sure to keep it in mind. Now let's list the time involved in the project. You've spent at least an hour at the hardware store (not counting drive time). You get home, get your supplies laid out, and are ready to get started. Remove the hardware from the piece (15 minutes on average). Sanding/deglossing & wiping down (1 hour). Let's start painting. Depending on the size of your piece, allow at least 1 hour per coat. Most pieces take at least 2 coats, sometimes more. Allow for adequate drying time, sometimes up to 24 hours between coats in humid weather. If you want a distressed look, more sanding will take 15-30 minutes. Another wipe down with the tack cloth and you're ready for your topcoat. You'll need at least 2 coats (sometimes more) to achieve the desired finish. Each coat should take an hour. As with the paint, allow adequate drying time between coats. Reinstall your hardware and reassemble your piece. Looks great, doesn't it? So how much time did it take, and what is your time worth per hour? A rough total of the above (not counting drying time) adds up to a minimum of 8 hours of hands-on work. At the current minimum wage of only $7.25 an hour, that's $58. Of course, a professional would charge more for their time, with a more professional-looking result. Just in supplies and labor the costs are a minimum of $114 or more (depending on your actual supply list and labor cost). Be sure to add in the cost of the dresser itself and any hardware repair/replacement. It can certainly be rewarding refinishing and repurposing your own furniture. There's nothing like the satisfaction of looking at a piece and saying, "I did that." However, if you're not the handy type, or don't have the time to devote, then a $200-300 dresser at Good Ju Ju doesn't look like such a bad deal!